It’s been a while since I last accepted an invite to be a speaker in a workshop or seminar. It’s just that I’ve become busier and busier with work that I don’t even have time to see my friends as much as I want to. But before this turns into a dramarama about how much I miss them and my occassional “me” time, let me invite you to my first workshop for the year! Woot! 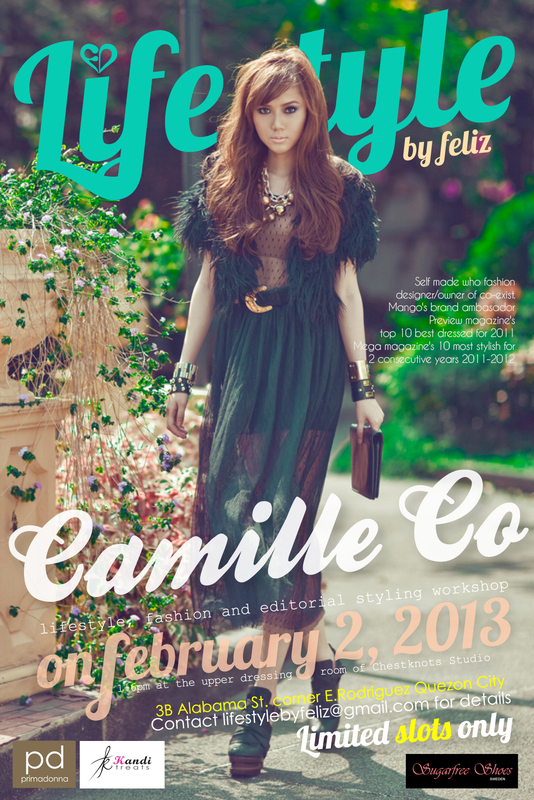 Lifestyle By Feliz has invited yours truly to speak at their lifestyle, fashion and editorial workshop this February 2 at the upper dressing room of Chestknots Studio located at 3B Alabama Street, Corner E. Rodriguez, Quezon City (search for “Chestknots Studio, Quezon City” on Google Maps for directions). Lifestyle By Feliz made this workshop an intimate event so slots are limited. If you want to register and know more details, contact lifestylebyfeliz@gmail.com right away before slots run out! I promise you, this will be worth your time! Aside from blogging, I will be sharing personal and lifestyle styling tips, how to develop a good eye when it comes to shopping, decluttering your closet and many many more! Elds Mejia, one of Manila’s most sought after art directors and stylists, is also part of the workshop. He will be focusing on conceptual and expressive styling, art direction and conceptualizing and styling for photoshoots. Both Elds and I have prepared a few activities for participants as well so needless to say, if you register, be prepared to get your creative juices flowing! This will be a fun-filled afternoon! Awwww happy birthday to your brother! Hi ms. pretty Cams! I would like to ask if it’s allowed to bring a 5 year old kid in that event?? BTW you’re so gorgeous in all of your pictures! That’s one of the photos from your Mango It Girl right? What’s next for you there? Sabi nga nila :) Thanks Abi! wow that sounds great ! congrats ! For affordable accessories and clothing. I get that same feeling nowadays and sometimes I wake up only wanting stay at home or meet up with friends without having to worry about waking up early the day after. If only I could come and hear your talk I would. If you know someone who will be recording it (if permitted), perhaps you could post it on youtube for those like me who want to but don’t have the chance due to location, time, or the like. I’ll be graduating Master in Environmental Management this March 23, 2013 in Ateneo de Manila University (same school as yours!). I’m just wondering where to buy a good dress for graduation and is it okei to have a hairdo since I’ll be wearing toga? An up-do is definitely not the perfect hairstyle. Have it styled but down lang :) Try looking for dresses at The Ramp? Woohoo! Hope to see you there!